You've Got To Believe - Star Wars Lesson 2 - Motivate Amaze Be GREAT: The Motivation and Inspiration for Self-Improvement you need! 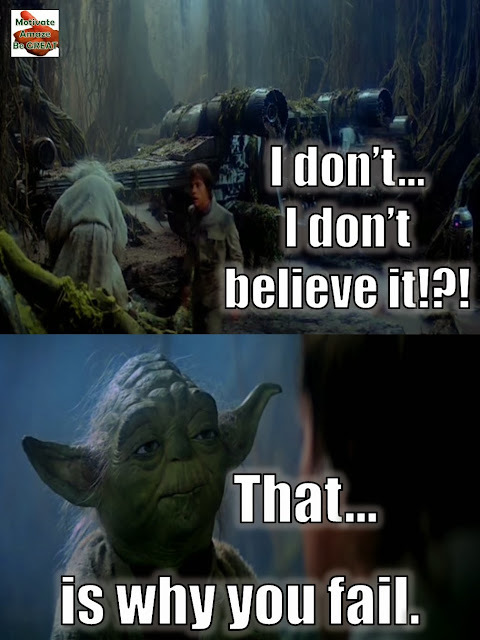 Luke Skywalker: "I don't...I don't believe it!?" Yoda: "That...is why you fail." The meaning behind this Star Wars inspirational quote: In order to do things that in your mind are impossible, you got to BELIEVE that they are in fact possible. Or else you will fail like Yoda says to Luke when he couldn't lift the spacecraft with the power of the force. You are the first person that as to BELIEVE in your DREAMS, GOALS, PURPOSES, OBJECTIVES. This one of the first major steps to succeed, when you believe anything can be possible!